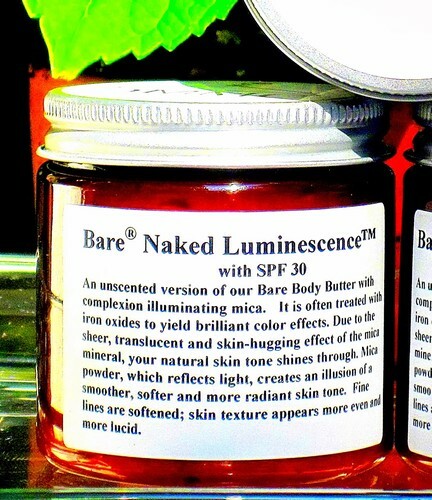 Bare Naked Face and Body Luminescence with SPF 30 4 oz. - A lighter and unscented version of our BARE Signature Body Butters, an unscented moisturizer with added zinc oxide for sun protection and light reflecting, complexion illuminating mica. What does mica do for your skin? Mica is a transparent mineral which is mined from the earth in thin sheets. It can be opalescent and sparkling or completely matte, ranging in color from grey to blue to green. It is often treated with iron oxides to yield brilliant color effects. Due to the sheer, translucent and skin-hugging effect of the mica mineral, your natural skin tone shines through. Mica powder, which reflects light creates an illusion of a smoother, softer and more radiant skin tone. Fine lines are softened by the light refractory properties of mica which counter the shadow effects of light. Without these shadows, which highlight wrinkles and imperfections, skin texture appears more even and more lucid. I also tried Bare Naked Face and Body Luminescence with SPF 30 4 oz. Yes, it's pricey, but it packs a multi-tasking punch with SPF 30, a versatile, body enhancing shimmer, tint, and moisturization. The very light cream looks liked cherry whipped cream in the jar, It is a lighter version of the Bare-ly Legal scented Body Butter, infused with complexion-illuminating mica and a touch of tint to give your skin a sun kissed glow. In case you're wondering, mica powder comes from minerals and reflects light creates an illusion of a smoother, softer and more radiant skin tone. This sensual product has: . Deionized Water, Octyl Palmitate, Grapeseed Oil, jojoba oil, hemp oil, Cetearyl Alcohol, Steareth-30, Ceteth-10, Cetyl Alcohol, Stearyl Alcohol, Chamomile, Boswellia Serrata, Tocopherol, Borage Seed Oil, Carbopol, Triethanolamine, Propylene Glycol, Diazolidinyl Urea, Methylparaben, Propylparaben, Fragrance, Mica, Zinc. If Bare Naked Face and Body Luminescence with SPF 30 doesn't get you to use sun protection, I don't know what product, will!